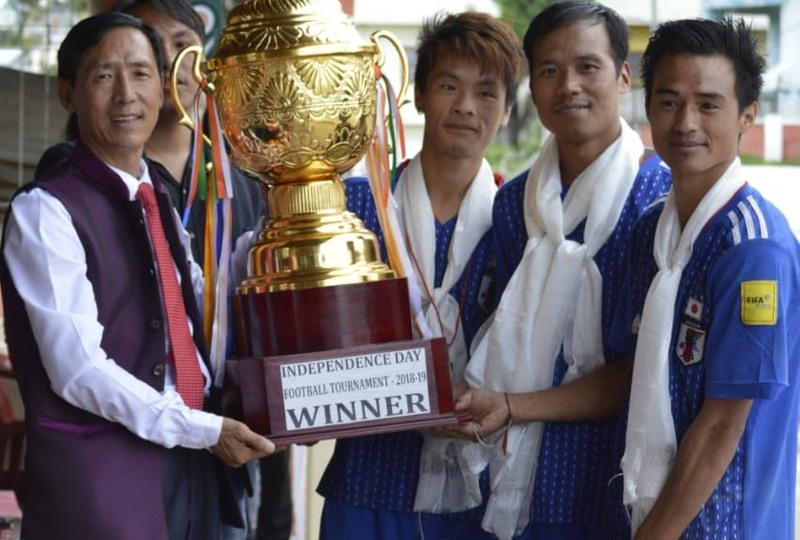 Sera Football Club (SFC) beat Bomdila Football Club (BFC) by 2 goals to 1 to be crowned champions of the Independence Day Football Tournament-2018, the finals of which was played at the Buddha Stadium at Bomdila on Wednesday last. The opening goal of the finals came from the boots of Rinchen Dorjee Karma which gave SFC an early lead in the match. The lead, however, did not last for long as a formidable BFC pressed hard and managed to equal the score just before the end of first half through Dorjee Khandu Wangja. The score was 1-1 when the first 45 minutes of game play ended. The second half turned out to be a treat for the supporters of both the clubs and the neutral spectators as both SFC and BFC battled it out hard to gain a lead in the match. It was, however, an exceptional free kick curled by one Kalu of SFC some 8 yards away from the box which hit the net and turned out to be the decider of the match. With the win, SFC walked away with a cool cash prize of Rs 1 lakh and the winners’ trophy while the runners’ up BFC got richer by Rs 50000. The ‘Best Player’ of the tournament award went to Sangjee Kali of SFC while Lham Norbu of the same team was adjudged the ‘Best Goalie’ of the tournament for his record of clean sheets. Earlier, while addressing the players as chief guest, former president of Sajolang Elite Society Aju Khonjuju, asked them to be disciplined in the field and off it as well. “Winning and losing is the part of a game as well as life. What matters more, is your participation and your dedication,” Khonjuju said while congratulating all the participants. Further appealing the youths to opt for one sport or the other in order to stay fit and healthy, the chief guest announced to carpet the Buddha Stadium with artificial grass so as to make it convenient and safe for the budding footballers. Speaking on the occasion, AWKSU general secretary Lashi Khandusow thanked Khonjuju and other invited guests for extending support in organizing the tournament. The tournament was organized by the All West Kameng Students’ Union (AWKSU) in collaboration with the West Kameng District Sports Association.